This year's garden is almost gone. It's been a very busy month for me because I'm trying to get some writing work finished before Christmas. Add to that some family happenings, a little repotting in the bush house and my home chores and you'll understand there has not been a lot of spare time. I'm sure you're in the same situation - December is a busy time for most of us. And that's okay because usually, we can balance that busyness with the relaxation and peacefulness of January. Here that means sitting with my feet up, watching the cricket or knitting and enjoying cold drinks with clinking ice cubes. Then, all the work done in December is forgotten, life springs back into perspective and I get my head ready for the new year. 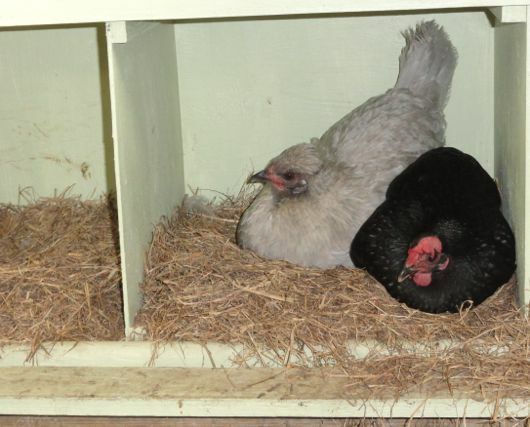 Best friends, Fiona and Mary, sharing an apartment as they brood and yearn for chicks. Penguin is releasing the Down to Earth ebook at the end of this week. It's for Australian release only and will be sold though Amazon, iTunes, Kobo, Google, Readcloud and Booki.sh. I believe the price will be $19.95. To co-incide with the release of the Penguin eBook, I've written another eBook called The Down to Earth Home Dairy which is written for home cooks with little experience with dairy other than drinking milk. It contains several recipes for making cheese - hard cheese, camembert, ricotta and a soft meltable cheese, similar to Kraft slices, but without the preservatives. It also contains what I know about making and storing yoghurt, how to make sour cream, buttermilk, pouring custard, baked custard, delicious milky puddings, butter, homemade condensed milk and vanilla ice-cream using the condensed milk. I have tried to present recipes that can often be made with what's already in the kitchen and although there are some special requirements, such as starters and rennet, I have included links to reliable places you can buy these from. You don't have to buy a cheese press. I have priced The Down to Earth Home Dairy eBook at four dollars. It is available for international release later this month and will be sold from my blog. The lace cap hydrangeas flowered just in time for Christmas. working out which glasses we'll be using for our Christmas lunch, then washing them. polishing the silver cutlery. I know this sounds posh and very unlike me but I have some very old cutlery that I like using and some of it needs polishing and washing to look its best. I haven't made a Christmas cake this year but if you've made a fruit cake, don't forget to keep pouring brandy or sherry over it. There is a thread at the forum full of Christmas cake recipes and encouragement. I know that I have enough homemade relish and pickles for our cold Christmas lunch buffet but I'll be making kimchee for a very special Korean lady. ;- ) If you want to add relish, chutney or pickles to your menu, you still have time to make them. start ginger beer from scratch. If I start that this week it should be nicely fermented in time for Christmas. Don't forget to check the threads on the forum today. The mods are working with me on this and they have started many excellent threads over there full of Christmas prep ideas. 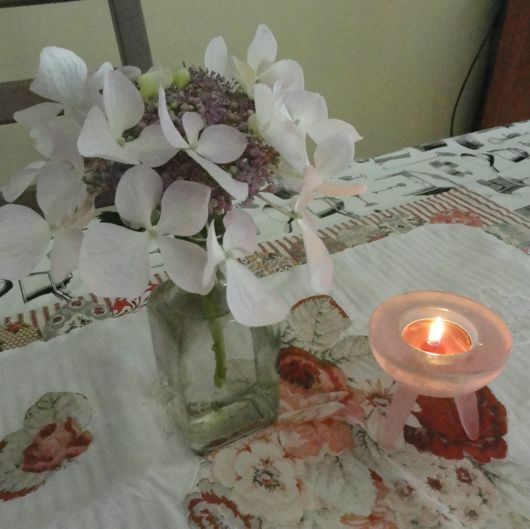 I just wanted to relay a message to you Rhonda, that the lovely FlowerLady of FlowerLady's Musings, lost her husband this morning. You have mentioned her blog several times on yours, and she is a lovely soul with a very heavy heart. Thank you for letting me know. She IS a lovely lady. What a sad day for her. Congratulations on the new ebooks Rhonda. No wonder you've been so busy, christmas alone takes it out of most us. I haven't done a great deal of preparation so far this year. No christmas cake or pudding by the looks of things. But I'm thinking of making a batch of apricot jam soon so I can use some of it to try a new ham glaze (recipe from Pod and Three Peas). Pork and trifle have also been requested again. We too look forward to those quiet, carefree days after christmas, with lots of leftovers :) Just wondering what do you think the best method of polishing the silverware is? I usually use the foil and soda crystals method. Tania, I would love to make apricot jam but it's too hot to grow apricots here and they're usually more expensive than the peaches, nectarine and cherries. I will live vicariously through your jars. I use the foil, bicarb and salt for the silver. It's the easiest way to just dump them all in the sink, then wash them. That dairy ebook sounds great. Looking forward to it. $4 for so much knowledge? Yet another reason to love your blog and what you are doing. Thank you. I feel really behind on my Christmas preparations after my computer failed for a couple of weeks. It's amazing how much I rely on it for everything from recipes, to addresses and shopping. Thank goodness for back-ups! I'm very glad I started early (e.g. Christmas cake) as the disruption has not ruined things, I just have to pull everything back together and get back on top of things. I cannot wait for the relaxing part of Christmas- those clinking ice cubes are already luring me with their siren song! Hello Rhonda, I'd just like to let you know that over the weekend we gifted our first set of home made presents after taking inspiration from your book and blog. They were so well received, I don't think we could ever go back to buying something from the shops. Thank you. I'm so pleased you like the idea of the dairy book. Good dairy products can cost a lot of money so it makes sense to make them yourself. Like everything I do here, I want to use what I already have. I am OVER buying new equipment so the recipes reflect that and call for common ingredients and utensils. Love the sound of the dairy ebook! I have always been interested in making cheeses, but have been intimidated by the equipment needed. The one thing I cannot seem to grow successfully are green beans. It makes no difference if they are seedlings or seeds; bush or climbing or time of year planted(I live in the subtropics. )The soil is free draining with plenty of compost, dynamic lifter, seaweed emulsion every 3 weeks and watering is regular. They start off beautifully, with copious amounts of flowers and then they start to wither from the bottom up. The stem at soil level looks darker and kind of hollow, and sometimes with bite marks??? I only ever manage to harvest a handful. I just cannot figure out wht I'm doing wrong!!!! Hi Farmer Wife. It sounds like you're doing the right thing by your beans although they don't like too much water and tend to rot if they have to sit in wet soil. But your problem sounds like some kind of wilt disease, maybe fusarium wilt. If it is, there is no cure apart from resting the soil for 4 or 5 years. Are you rotating crops? 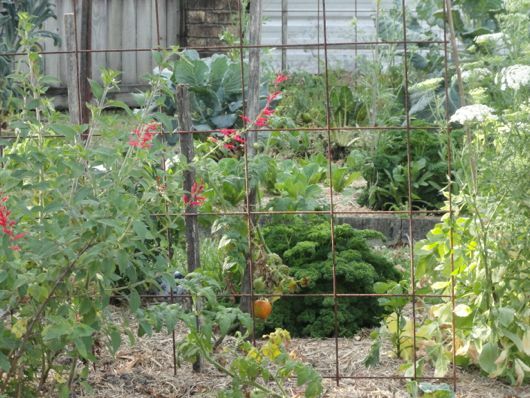 Don't stop planting but if you can avoid that area and maybe expand your garden in another area, that might get around it. When do you plant? peas and beans seem to do better in winter in the subtropics and tropics. The problem with my beans is the bean fly! I now know what steps to take. It has also been suggested I grow snake beans in summer. I'm so pleased to hear about your new Ebook Rhonda...i am still constantly referring to your down to earth book and have quite a few family members who now want one for Christmas! Your posts always bring alittle sanity back into my world...i recently wrote about how i wanted to try and get some simplicity back into our Christmas season as i seem to be always stressed....i then felt guilty about writing the post for fear people would think i had lost my Chrissie spirit and the twins had a grinchy Mum hehe....but reading your posts always helps me feel better about the path i am trying to travel...thankyou :) I think i am going to have to wind down our garden too...the heat and humidity is really taking it's toll...we also have a real problem with ladybugs on the Zucchini, eggpllant and silverbeet...have you ever had the pest sort? I'm not sure how to get rid of them without spraying...they are doing some awful damage! Dear Jode, I have a feeling that you're too hard on yourself. Think carefully about what you write, then own it. Don't second guess what people might think. If you've given a truthful account of your own ideas and thoughts, then that's it. There is no reason for guilt. You seem to be a thoughtful and hardworking young woman and I hope you're not striving for perfection. Never aim for perfect, just try to do your best. If you go to bed every night knowing you did your best that day, that is a great achievement. Rhonda you couldn't have timed the new ebook better for me! I have asked Santa Tony for one of the Mad Millie cheese kits so once it helps me get my toes in the water your ebook will take me out to the surf! Thanks for popping into the blog today - yes, I have returned, bit by bit. It's so good to hear your news about the e-books, I love your hard-cover book, of course, but I can also see great success for you through e-books as well. The cheese-making book sounds like something I might have a go at. btw, your garden looks pretty fine to me, even if it is finishing up. Hi Rhonda, I am a bit late here today but I also can't wait until I can get my hands on the dairy ebook. You have been busy! Hi Rhonda, you'll never guess, I'm in the middle of packing up our unit in Darwin because now we're off to Warrnambool in Victoria. Almost a direct line south. The weather will be more like Toowoomba - warm summers and cool winters. No more sweating it out in the NT sauna. You probably didn't know that I used to teach cheesemaking at Northey St City Farm, so I thought I'd share with you my recipe for homemade mascarpone cheese - for you to include in your book if you like. For some reason it's really expensive in the shops, but it's so easy to make. All I do it use one carton (the small one, 200ml??) of UHT cream (because this is always stocked in my pantry) and then I add a tablespoon of white vinegar and leave it in the fridge overnight. The next day it's thick, smooth and creamy = magic. I use it in tiramisu as well as any recipe that calls for Creme Fraiche. Good luck finishing the book, I'm sure it will be a hit! Candice, thank goodness you're getting out of Darwin. It's had really high temps lately, hasn't it? I can't cope with the hot humid nights there. Warnambool's climate will be much nicer for you. I didn't know you taught at Northey Street, you wily fox. I'll get some UHT cream, try your recipe and include it in the book if it's as good as you say. Thank you for sharing. Happy travels. Darwin during the dry season was a dream, but I'm happy we're moving on; It's too hot to take the baby out for a walk each day. Good luck with the mascarpone, you might be able to come up with a fail-safe recipe. Ok, my mini break is over, better get back to packing :)ps. We also had a mild earthquake over night. And it reminded me that we should all have emergency plans: which part of your house would you take cover in during a quake/bomb/storm?